This room is 44 sq m and if required can be partitioned into 1 2 or 3 rooms. As a single space the room can be set out to accommodate up to 25 delegates (40 Theatre Style) . Technical specifications are set to a high standard with constant broadband, a large flat screen TV, as well as flip charts and whiteboards. Laptops are available free of charge on request. Facilities for Tea, Coffee and biscuits are available. Buffets can be provided by arrangement (minimum 12 delegates). The room will be set out as you require. Charges for this room are £12 per hour as a full suite or partitioned the charges start from £6 per hour for a small section and £8 per hour for a large section. 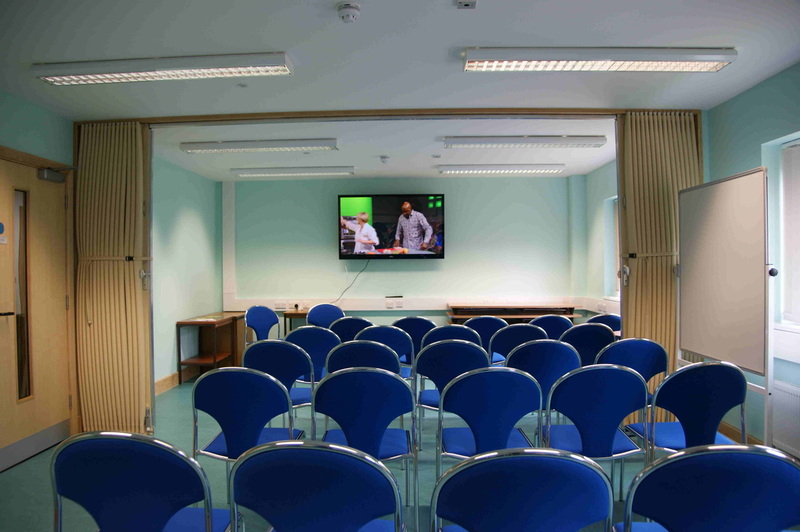 We currently offer the meeting room at a reduced rate for daily rental (9am - 5pm) at just £60 with free use of equipment. Please note: flip chart paper, photocopying and general administration services are available at extra cost.